Sindh Institute Of Urology & Transplantation (SIUT) Karachi Sindh. SUIT on over 850 Bedded tertiary Care leading hospital providing comprehensive care to patients with renal and related diseases. Eligibility: FCPS (Surgery / Medicine) or equivalent with interest to work in challenging environment fresh postgraduate may also apply. 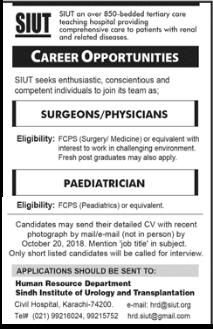 Eligibility: FCPS (Paediatrician) or equivalent. Candidates may send their detailed CV, with recent photographs by mail/email (not in person) by October 20, 2018. Mention Job Title in The Subject Line.